Bolt, Lilo, Stitch…plus their creators! 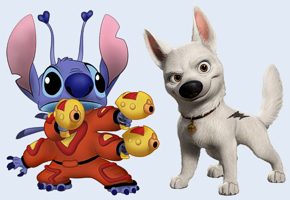 The character standoff on the right will of course be a fairly ironic sight to those who followed Lilo & Stitch director Chris Sanders through the making of his intended next film, a canine road movie that went under the name American Dog. Of course, the movie changed dramatically under new Disney honcho John Lasseter and eventually emerged – sans Sanders – as Bolt, which was released to Blu-ray over the weekend, but comes to regular DVD (if stores weren’t selling it already!) today. As if to make a point, Sanders’ Lilo & Stitch also comes to DVD today, in the two-disc set that we have been anticipating for around seven million years, it feels like. Reviews for both are on the way, but in the meantime, we have no less than three juicy new interview pieces from our always dependable Jeremie Noyer! First up, he joins various onliners for roundtable discussion with Bolt‘s story supervisor Nathan Greno and voice artist Mark Walton, both of which teamed up again to create the disc’s exclusive new short Super Rhino, which marks Greno’s directorial debut. With some varied questions and interesting answers from the pair this is a good in-depth read, even if it can’t quite escape the continuing world invasion by Miley Cyrus! Next up, Jeremie himself speaks to Lilo & Stitch‘s producer Clark Spencer, in a very rewarding discussion about how the film came together back in the glory days of Walt Disney Feature Animation Florida. Once again there’s a lot of fascinating information here, especially about the including of the film’s signature Elvis songs and the authentic Hawaiian sound achieved in the score. What’s more, Jeremie will be back tomorrow, speaking with the movie’s directors Chris Sanders and Dean DeBlois!